Recent trends demonstrate an accelerated migration of healthcare applications to cloud platforms. Initially reluctant, the risk-averse healthcare sector seems to have learnt from other industries' successful experiences in taking advantage of cloud benefits, such as lower costs and enhanced agility, without compromising data security. Put simply, the healthcare industry is beginning to trust the cloud. This change in attitude not only signals a technical IT change but is part of a much bigger transformation. Cloud computing is at the heart of a more digital, collaborative, patient-centered, and data-driven healthcare industry. The article will discuss the federal R&D tax credit opportunities available for companies developing new and improved cloud solutions for healthcare. Cloud computing is a comprehensive solution that delivers IT as a service. It allows for providing and sourcing IT services on a "pay-per-use" basis using web-based tools and applications. Different from traditional models, cloud services are considerably elastic - they can be configured, adapted, and scaled to meet specific needs. Therefore, cloud computing generally entails less up-front investments and operational expenditure than conventional IT models. In the cloud model, instead of handing over IT resources to be managed, costumers plug into the cloud, treating it as an internal data center or computer. In most cases, the cloud features self-service interfaces where costumers can obtain resources for as long as they need. In addition to reducing investments in infrastructure, cloud solutions facilitate application development and deployment, and save resource allocation overhead. Clouds can be private, public, or hybrid. A public, or external, cloud is fully owned and provided by a third party vendor. It is located outside a company's firewall and is also referred to as a shared, multi-tenant infrastructure. A private, or internal, cloud is an environment located behind a firewall and dedicated to a single company for exclusive use. Finally, in a hybrid cloud, a company is able to retain confidential information in a private cloud while having access to external services offered by public clouds. Infrastructure as a Service (IaaS) provides servers, virtual machines, storage capacity, load balances, etc. Platform as a Service (PaaS) provides a computing platform and environment for application and service development. Software as a Service (SaaS) is a complete software application that is delivered to the end-user via the cloud. Imprivata's 2013 Desktop Virtualization Trends in Health report revealed that healthcare organizations are more willing to migrate to cloud computing than they have been in the past. While in 2012, only 9 percent of respondents used the cloud model, this year 30 percent of them did. e)Transforming access to health services in emerging markets without heavy investment in physical hospitals and clinical centers. 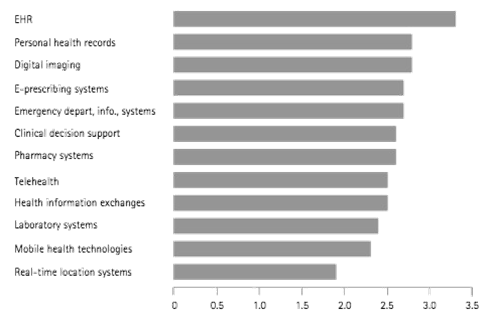 The following chart, originally featured in Ovum's 2013 Trends to Watch: Healthcare Technology report, presents a list of hospital's IT priorities as ranked by CIOs. The different categories give us an overview of potential cloud computing applications. According to the previously mentioned Imprivata report, the most common cloud application currently used in healthcare is the electronic medical records (EMR) system. This is followed by application access, imaging archiving, and communication systems (PACS) storage. Respondents saw great promise in cloud-based electronic prescribing and secure text message, which are expected to intensify in the next two years. The multiplication of cloud-based solutions for the healthcare industry illustrates the revolutionary potential behind this new wave of IT innovation. Companies engaged in R&D activities aimed at fostering the widespread adoption of cloud computing in healthcare may be entitled to significant federal tax credits. The following paragraphs present examples of recent innovation efforts in this field. Headquartered in San Jose, CA, Cisco Systems has developed a number of cloud-based solutions for the healthcare sector. Cisco's Medical Data Exchange Solution, for instance, provides the infrastructure necessary to carry out Health Information Exchanges (HIEs) along with similar shared healthcare services in the cloud. The system gives healthcare providers the flexibility necessary to support the increasing exchange of data, images, and video. Cisco's solution includes the Cisco Medical-Grade Network, the Cisco Unified Computing System, and Cisco collaboration tools. AT&T Medical Imaging and Information Management Solution (MiiM) is also a cloud-based solution that helps hospitals store, access, and share medical imaging. In addition to overcoming time and cost consuming inefficiencies, such as the necessity of searching through multiple systems for patient images, the solution also advances virtual collaboration among health professionals and mutual interpretation of patient images. It enables instant access to images from anywhere and facilitates the creation of hospital networks to manage referral patient images in cases of reallocation. Located in San Francisco, CA, Practice Fusion, Inc. has pioneered an innovative, free cloud-based model for electronic medical record technology. The software solution helps manage the relationship with patients and other healthcare agents. According to the company, there are currently 150,000 health care providers using its services on 60 million patients. The no-cost approach is made possible through advertising and the establishment of connections with partners' services, such as labs and pharmacies. In April 2013, Practice Fusion launched a new service, Patient Fusion, which enables the online scheduling of appointments with any participating doctor. In addition to the convenience of knowing which doctor from the Practice Fusion Network is available at the time needed, patients can also review their physicians after each visit. Once an appointment is booked, the doctor has automatic access to the patient's health history from Practice Fusion. According to the Centers for Disease Control and Prevention, in 2012, 72% of office-based physicians used electronic medical record or electronic health record (EMR/EHR) systems, up from 48% in 2009. As cloud-based EMR systems grow, so does the data they collect. Access to Big Data can change the face of healthcare, producing system-wide improvements. Potential advances include the consolidation of evidence-based care, the spread of informed lifestyle choices, the establishment of effective settings for treatment, and the boosting of R&D productivity. As pointed out in McKinsey's report The 'big data' revolution in healthcare: accelerating value and innovation, the emergence of healthcare Big Data will create new value pathways and foster an ecosystem feedback loop. The use of Big Data can also contribute to better diagnosis. IBM's Watson, a language-proficient computer system initially created to answer questions on the show Jeopardy!, has the ability to assimilate and analyze an enormous quantity of data. Its cumulated "knowledge" includes "more than 600,000 pieces of medical evidence, more than two million pages from medical journals and the further ability to search through up to 1.5 million patient records", an amount of information no human doctor's mind can match. IBM, in partnership with the Memorial Sloan-Kettering Cancer Center in New York and the American private healthcare company WellPoint, is working to enable oncology hospitals, clinics, and individual doctors to rent time with Watson over the cloud. Watson's wider deployment would significantly increase accuracy of diagnoses while simultaneously reducing costs. When tested for lung cancer diagnoses, Watson's success rate was 90%, compared to an average of 50% for human doctors. Another interesting example of innovation comes from Minneapolis, MN, home of Fairview Health Services, a network of 10 hospitals and 42 clinics. The company created a cloud-based communications platform that enables doctors to conduct virtual video "visits" with patients, and program future visits. The solution has improved care coordination and reduced costs - being cloud-based, the only hardware costs consist of headsets and video cameras. The innovative system enables physicians to consult with patients from their homes and pharmacists to guide them through medication therapy management. The use of encrypted communications guarantees Fairview Health Services' compliance with the Health Insurance Portability and Accountability Act (HIPAA). OrthoSensor Inc. is developing innovative solutions to deliver intelligent orthopedics. The company's sensor-equipped implants would provide doctors with constant information about the patient's conditions (range of motion, temperature, fluid build-up, infections, pain, etc). Such data would then be linked to a cloud-based system that can analyze it and incorporate the resulting information to electronic health records (EHR). The healthcare industry has been pushed towards the cloud. The growing necessity of different organizations to share information, the rise of mobile health, new standards of meaningful use of HER, the accountable care organization (ACO) model, and the ICD-10 switch are a few drivers of the recent migration to cloud computing. However, from an industry-wide perspective, the cloud computing model is still in its early stages of adoption. Significant R&D efforts will be necessary to resolve the concerns behind persisting reluctance. Privacy and security are major concerns in an industry permeated by sensitive information (known as Protected Health Information, or PHI). Complexity is intensified by industry-specific security concepts, such as consent, data access history disclosure, and proxy health data custodians. In addition to tackling the risks of unauthorized access or loss of PHI, cloud-based solutions must support the compliance with strict regulation requirements - such as The Health Insurance Portability and Accountability Act (HIPAA), The Health Information Technology for Economic and Clinical Health Act (HITECH), and The Federal Information Security Management Act (FISMA). Promising alternatives include "self-protecting" data, which consists of building security and authorization access into the metadata attached to the data itself - a system that allows security to follow data as it moves across cloud services, networks, and devices. Cloud-based identity and access management services can also take advantage of advanced biometric, geo-location authentication, and risk-based, adaptive authorization. For data exchange, encryption and tokenization have proved successful in other industries. In short, the widespread adoption of cloud computing by the healthcare industry must come hand in hand with the development of potent analytics-based security systems capable of neutralizing ever-evolving threats. Cloud computing is bound to promote an unprecedented level of data availability in the healthcare industry. Transforming this data into useful information, however, is an outstanding challenge. Industry-specific predictive analytics software must be designed to enable the beneficial use of Big Data in healthcare through the generation of reliable actionable information. Predictive analytics software is already helping hospitals improve outcomes. California-based Predixion Software specializes in healthcare predictive intelligence. The company has introduced the innovative idea of self-service predictive analytics, aimed at simplifying the process of sharing models and automating predictions for non-technical end users in healthcare. Potential uses of Predixion's solutions include preventable readmissions, length of stay estimation, hospital acquired conditions, chronic care management, predictive illness/disease progressions, identification of high cost cases, among many others. A growing number of healthcare organizations are migrating to cloud computing. While benefits are evident, challenges remain, particularly when it comes to privacy, security, and predictive analytics. Companies engaged in innovative efforts to accelerate the adoption of the cloud model in healthcare may be entitled to significant federal R&D tax credits.